rec. 2014, Studio 2, Bayerischer Rundfunk, Munich. Made as part of Gil Shaham’s residency with the Symphonieorchester des Bayerischen Rundfunks during the 2013/14 season, this set of J.S. Bach’s Sonatas and Partitas for solo violin is full of fascinating details and insights. Shaham avoided performing these works for a long time, but now declares that “there is no greater joy than playing Bach.” This sense of joy does leap out at you from these performances, which are brisk and animated in superlative recorded sound. There are numerous other aspects to these performances relevant to the listening experience. Vibrato is used more as ornament than as a general texture to sound, though you will hear sustained notes such as those of the Sarabande of the Partita BWV 1002 given expressive support in this way. Shaham’s vibrato in Bach is light and unobtrusive, and to my ears in perfect proportion to the pace and sensitivity of the interpretations in general. Shaham also switched from more modern wound-gut strings to Baroque-style sheep-gut strings during the recording sessions, a difference you can hear in the more silvery upper harmonics with which CD 1 opens when compared to the lighter, more breathy tones at the start of CD 2 – both qualities to which your ear can adapt very quickly. This means the great Ciaconna from the Partita BWV 1004 is played on the old-school strings, and the lightness of texture it gains from this removes it further still from all of those monumental piano and other versions – including those of many other violin performances which seek out its theatrical qualities. Yes, this remains a dramatic piece filled with harmonic stresses and technical marvels, but in this case all post-Baroque and ‘gothic horror’ associations fall away, and we’re left with something quite pure and transparent which fits in perfectly with the movements which precede it. Comparisons of the many recordings of J.S. Bach’s great Sonatas and Partitas for Solo Violin would turn any such review into a marathon exercise, and tastes and moods differ so much that no single version can be said to offer the ‘ideal performance’. Going back to the original manuscripts is no guarantee of swifter tempi, and Isabelle Faust’s delightful selection on Harmonia Mundi HMC 902059 is gentler and more reflective than many, with more of that “small softness” at the beginning of each stroke mentioned by Shaham, a quote from Leopold Mozart. A polar opposite to Gil Shaham might be Shlomo Mintz’s 1984 recording for Deutsche Grammophon, which appeared on 3 CDs when first released on 413 810-2 though it was subsequently squeezed onto two discs when re-released as part of the DG ‘Masters’ series. Mintz’s more traditional ‘romantic’ view of these works from 20 years ago seeks emotional weight and more sustained beauty. His Corrente from the Partita BWV 1004 sounds playful in relationship to the surrounding movements, but put against Shaham it becomes positively pedestrian. Who is to say which is closer to what Bach would have considered a natural pace? If you know and love Mintz you might find Shaham racing head over heels to start with, but once you become attuned to his approach and appreciate the thoughts behind each piece then it doesn’t take long to find the fine qualities in these performances. In his less measured pacing, Shaham discovers more of the improvisatory nature of some movements, releasing Bach’s inner folk-fiddler rather than drawing on his status as one of the greatest of Church composers. Gil Shaham’s Bach is swift, but if you seek the inner pulse of each piece then you will find none of them is rushed. The Fuga of the Sonata BWV 1005 comes in at a rapid 8:12 when compared to Shlomo Mintz’s 10:02, but he gives the music plenty of breathing space and moments of rubato, by no means inundating us with impetuosity but indeed providing something exhilarating and with an irrepressible momentum. Shaham also finds the poetry in the slow movements, as can be heard in the Largo which follows, Bach’s lyrical lines unfolding with a genuinely expressive feel. The ordering of the pieces by their catalogue numbers on these 2 CDs means that we finish with the Partita BWV 1006 with its famous Preludio and fun-filled final Gigue, a choice of closing music which in many ways sums up the entirety of this recording. 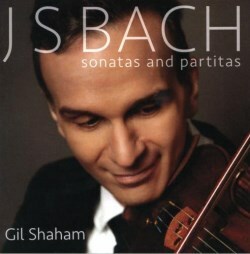 Releasing Bach’s solo violin works from a potential straitjacket of semi-ecclesiastical seriousness, Gil Shaham delivers a set whose animated liveliness provides new perspectives on old favourites, and I for one like it very much indeed.